Born 8 April 1883, Glasgow, Scotland. A noted zoologist who made key discoveries of the life cycle of Trypanosomes. African trypanosomiasis remains endemic in central Africa today. The parasites invade the central nervous system and brain, where they cause many neurological symptoms, including disruption to sleep-wake patterns, which have led the disease to be referred to as sleeping sickness. Muriel Robertson was a Glasgow graduate who made key discoveries of the life cycle of Trypanosomes. 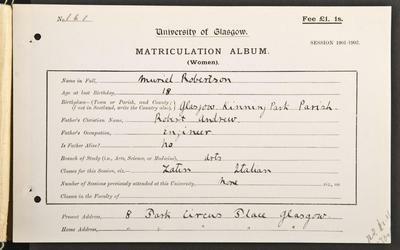 Born in Glasgow in 1883 Robertson was educated at home before matriculating to study at the University in 1901. Although she initially followed a traditional curriculum in Latin, Italian, English and Philosophy, she also excelled in Botany and Zoology, and by her Final year matriculated in Arts and Medicine. In 1905, she graduated MA but was by then firmly pursuing scientific research. The Professor of Zoology, Graham Kerr, encouraged her as an undergraduate by giving her a bench to work on protozoa. In 1923 she received her DSc from Glasgow for a thesis entitled A study of the life histories of certain trypanosomes. In 1907 she moved to Ceylon to study trypanosome infections in reptiles. 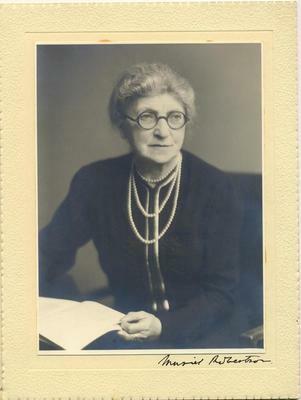 She joined the Lister Institute in 1909 and worked there until 1962, long after retirement. On a temporary posting in Uganda in 1911, she researched the lifecycle of T.gambiense in blood and in its insect carrier, the tsetse fly, publishing her path-breaking results. She was awarded an LLD in 1948 having been elected to the Royal Society the previous year.